Staged over an extended three miles, the Grade One RSA Chase is the championship race for staying novice chasers and a host of talented individuals are among this year’s 71 entries. Punchestowns has a huge reputation and was runner-up to Big Buck’s in the 2009 Grade One Ladbrokes World Hurdle at The Festival. Nicky Henderson’s charge was impressive when winning a Grade Two novice chase at Newbury in November. The trainer has also engaged star French import and impressive Grade One Feltham Novices’ Chase hero Long Run, as well as Burton Port and Viking Rebel. The popular Mighty Man was top-class over hurdles and has also finished runner-up in the Ladbrokes World Hurdle, when behind the great Inglis Drever in 2007. Henry Daly’s charge saw off Forest Pennant to win over fences at Hereford in December and won his second race over the larger obstacles at Huntingdon on January 27. Another Grade One-winning hurdler with a lofty reputation is the Nick Williams-trained Diamond Harry, who won his first novice chase start when defeating the smart Knockara Beau in a Grade Two contest at Haydock on January 23. 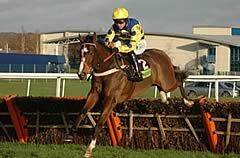 Paul Nicholls won this race with Star De Mohaison in 2006 and the great Denman a year later. He has entered four this time, headed by Inchidaly Rock, winner of the Ryman The Stationer Novices’ Chase at Cheltenham in November. He also has Take The Breeze who was third to An Cathaoir Mor in a Grade One at Leopardstown last time, The Nightingale and Forest Pennant. The David Pipe-trained Seven Is My Number won the Grade Two Dipper Novices’ Chase at Cheltenham on New Year’s Day from Pigeon Island and the trainer has also engaged The Package and The Sliotar. Ogee was a Grade One winner over hurdles for Renee Robeson and landed his first two starts over fences before coming home third to Long Run at Kempton, while the Jonjo O’Neill-trained Theatrical Moment won twice at Leicester in December. A 26-strong Irish entry includes a pair of Grade One novice hurdle winners from last season’s Festival - the Willie-Mullins-trained Mikael D’Haguenet, victorious in the Neptune Investment Management Novices’ Hurdle, and the Charles Byrnes-trained Albert Bartlett Novices’ Hurdle hero Weapons Amnesty. The latter went down by a short-head to the Noel Meade-trained Pandorama in the Grade One Knight Frank Novice Chase over three miles at Leopardstown on December 28. Meade could also saddle Grade Two Woodlands Park 100 Club Novices’ Chase winner Oscar Looby and Realt Dubh. Mullins, successful three times (2009 Cooldine, 2004 Rule Supreme, 1998 Florida Pearl), has engaged eight horses in all. Included among them are 2008 Weatherbys Champion Bumper winner Cousin Vinny, Apt Approach, Quiscover Fontaine, Citizen Vic and Uimhiraceathair. Edward O’Grady has entered Catch Me, a top-class hurdler in previous seasons, who was third to Pandorama at Leopardstown, while the Tom Mullins-trained Aranleigh landed a Grade Three novice chase at Punchestown in November. French trainer Francois Doumen is no stranger to Festival success and he has engaged Doctor Pat, successful in novice handicap chases at Sandown and Newbury in December. Other exciting entries to note are the Ian Williams-trained Hunters Ploy and stablemate Weird Al, twice successful at Cheltenham already this season, as well as the Keith Reveley-trained Tazbar, who sandwiched a second place to Long Run in the Grade One Feltham Novices’ Chase between victories at Musselburgh and Huntingdon. Alan King has entered Blazing Bailey, Junior and Bensalem, while Howard Johnson has engaged the smart pair of Abbeybraney and Door Boy. Also among the entries are Den Of Iniquity, Ernst Blofeld, Gansey, Edgbriar, Mobaasher, Mount Oscar, Petitfour, Sullumo, Clan Tara, Jessie’s Dream and Superior Wisdom. Class 1, Grade One, £150,000 Total Prize Fund. 2.40pm Cheltenham, Wednesday, March 17, 2010. For novice 5-y-o+, three miles and half a furlong. Weights: 5-y-o 11st 3lb; 6-y-o+ 11st 4lb. Allowances: mares 7lb. Entries closed January 26, entries revealed January 28 (71 entries), scratchings deadline February 23, six-day confirmation stage March 11, final declaration stage 10.00am, March 16. Form figures supplied by Weatherbys and are correct up to and including the racing of Tuesday, January 26. May not include some overseas form.